In the morning of the 21 January the weather was very foggy with light rain and after 13h it was snowing a lot . 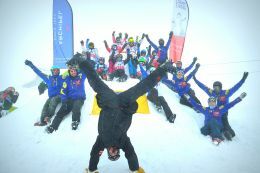 Pappos Baldumis Ski school gave discounted ski & snowboarding lessons to children under 14 as well as free equipment for them, all day long. Children had the opportunity to ski and snowboard for free with Athens Ski Club trainers, help us finish the 4 meters tall Snowman, play in and out of the Igloo and experience sledging. Although totally wet at the end of the day, they all left with presents, diplomas soft drinks and a big smile. 41 Volunteers worked for the event including red-cross rescuers and Athens 2004 volunteer association. Klaoudatos skibus transported them for free and gave discounted prices to all kids under 14. Parnassos Ski Resorts offered a 2€ day pass and a 5€ lunch menu with soft drink to all children. 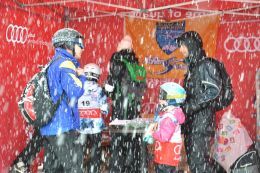 Thank you for participating, we are already looking forward to next year's World Snow Day hoping for better weather conditions.